2016 was the year that our competitors decided to move away from swimwear. With that decision came opportunity. The opportunity to claim part of what is a $500M business was worth the exploration . 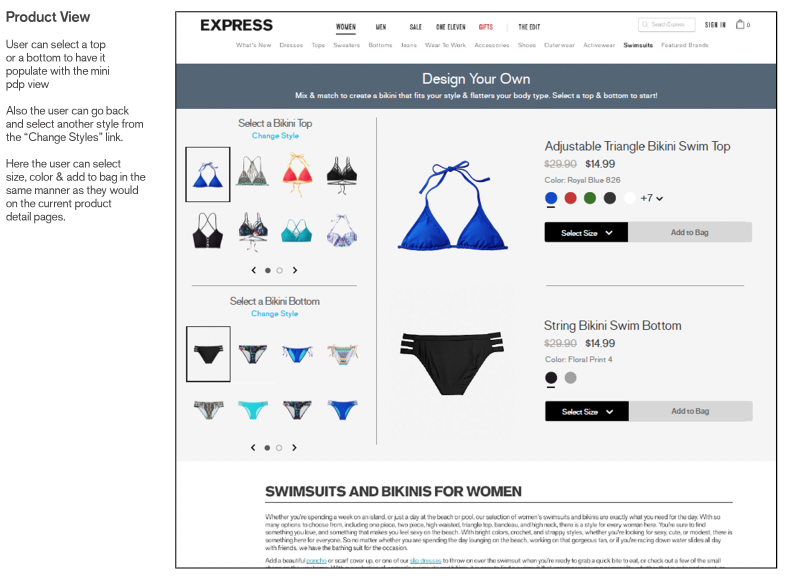 Express tasked me with trying to find a way to help our customers make a better informed decision in exploring and purchasing options for swimsuits. They wanted to give her the ability to pair any style of swimsuit top available with any style of swimsuit bottom. Understanding what information is imperative, plus the ability to see the options possible was the starting point in the discovery process. 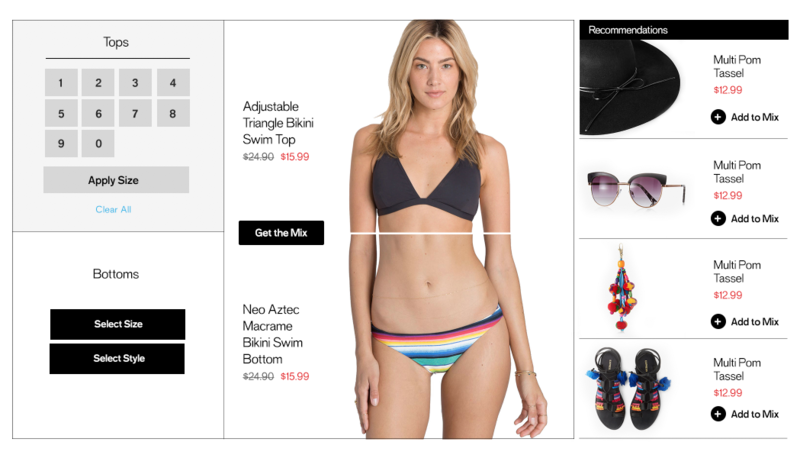 I led the experience design for the EXPRESS Swimsuit Finder (Mix & Match) across desktop and mobile web. Having partnered with a project manager, a UI designer and a business analyst to uncover insights and translate concepts into features that address customer behaviors and motivations, frameworks and prototypes were created to share the vision, design principles and content strategy. This helped to evangelize ideas, gain alignment and drive decision making. With help from my project manager partners, I addressed customer goals and balanced with business goals. I prioritized and lobbied for important features for launch and beyond. 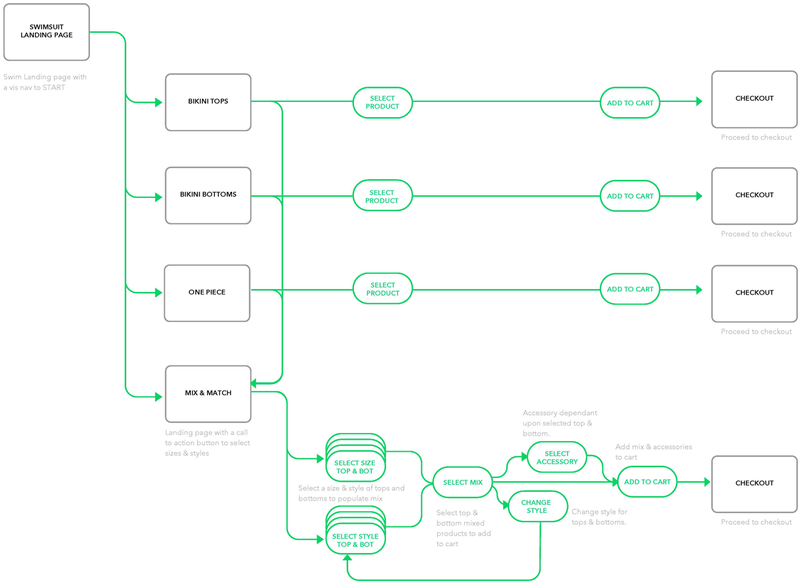 Defining the entry point pathways and exits with simple user flows. I defined the experience with my project manager partners. I evangelized customer goals and balanced business goals. I prioritized and negotiated features for launch and beyond. Our challenge was to capture the vacant market share with a simple tool that would allow the customer the ability find swimwear that fit pre-owned products or varying tastes. In favor of speed to market, we were tasked to design and build Mix & Match within the existing digital architecture. This tactic was perceived to be advantageous and the least riskiest. Managing the conceptual model that would be quickest to engineer and leverage the existing infrastructure to get to market sooner and cheaper. This early architectural decision had a major impact on the quality of the customer experience that would be easy to iterate. Fast and intuitive way was necessary to move in and out of selecting styles and finding available sizes. Segmenting sections for tops and bottoms to accommodate for selectors that after selected would transform to show available product in flats. In the product viewport window is where chosen flats on the left would populate on the modal view. In the user research I looked at most important information that users needed upon selection. 88.6% of users said that price most important. We also wanted to give the customer the ability to make a complete look by making accessorizing simple. There would be a manually curated set of products that would coordinate with the either the "tops" selection or the "bottoms" selection. The would give added value to the customer and a new avenue to generate revenue but it also solidifies as a brand an authority on styling multiple pieces. The gallery below shows some of the Mobile & Desktop design.